Thanks to the tenacity of Alison Norris ’18, Valpo is home to a chamber music ensemble nicknamed the “STEM Quintet,” enabling a group of five individuals with varying interests to incorporate their love for music into their arduous academic schedules. Alison, who recently graduated with a degree in mechanical engineering, was a member of the Symphony Orchestra throughout her first three years on campus. While Valpo’s music department offers an array of options for non-majors, when Alison sought to expand her musical involvement by joining a woodwind quintet, there were no openings for a flautist. Thus, with the approval of the music department, Alison took initiative to create an additional quintet. 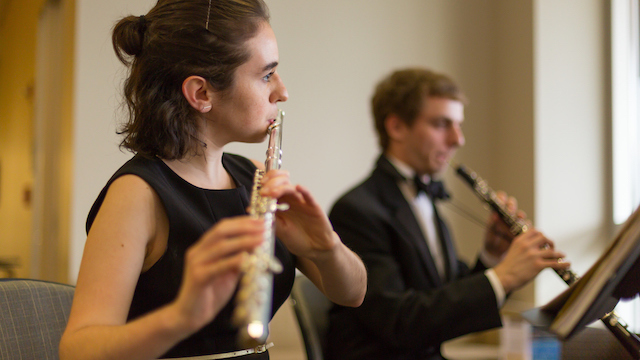 Launched in fall 2015, the quintet is comprised of all STEM majors — Brian Thomson ’17, mathematics major, clarinet; Timothy Henderson ’20, electrical engineering major, oboe; Sarah Kuchel ’19, electrical engineering major, bassoon; Janelle Wigal ’18, electrical engineering major, French horn; and Alison, mechanical engineering major, flute. Entering its third year, the STEM Quintet is coached by Professor Grodrian, who assists the musicians in refining their pieces in preparation for performance. The ensemble has made notable appearances across campus and continually seizes new chances to perform for the community. Most recently, the group was invited to play for the College of Engineering’s National Council meeting. They also performed pre-concert music for the Christmas concert and played in Abendmusik, the music department’s largest and exclusive chamber music performance. Alison’s determination opened up possibilities for her fellow classmates. The quintet members are able to experience their love of music in a new way and engage with members of the Valparaiso community through performance. Janelle refers to the STEM Quintet as the “best part of her week,” attributing this to the fun, positive group dynamic and the high level of musicality they are able to achieve together. A highlight of her time with the group occurred over spring break, when the quintet embarked on a five-state tour from Michigan to Tennessee, with hopes to impact other students who want to be active in music in college, but not necessarily as music majors. 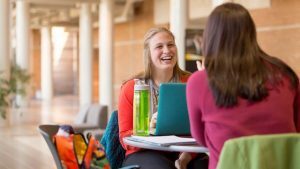 From Tennessee, Janelle decided to attend Valpo as the University, unlike most other schools, was willing to assist her in embracing all her interests — engineering, music, and track. Reluctant to join the STEM Quintet initially, Brian now says the quintet is his favorite music ensemble of all time. He expresses gratitude for his Valpo experience, attributing Valpo with his ability to pursue varying interests, specifically, the power to “bridge the gap” between mathematics and music. Additionally, at Valpo, he has been able to fully embrace his “love” for education, no matter the field. For Brian, this “power of choice” afforded him the freedom to take a variety of courses and explore whatever topics compelled him. The College of Engineering further enabled Alison to combine her two passions, music and engineering, through a research experience, requiring her to write computer code that randomly generates sample pieces of music. Alison was challenged with the task of writing code that will determine when one piece of music is better than another piece of music. Through her program, Alison assigned a “fitness” value to each sample of music and fed it different criteria to improve their fitness value.